Lava added another budget smartphone to its product portfolio. The new handset is dubbed as Flair P1 and will be available soon online and offline. Flair P1 will be offered in black and white color options. Mumbai: The new Lava Flair P1 handset sports 4 inch display and the resolution is 480 x 800 pixels. It is powered by 1 GHz processor whose clock speed is 256 MB RAM. It is provided with 512 MB internal storage which is low but there is facility to expand memory up to 32 GB via micro SD. The handset features 2 megapixel primary camera and there is also 0.3 megapixel front facing camera. It runs on Android 4.4 Kitkat operating system. Apart from usual connectivity features it also supports 3G connectivity. This budget smartphone has 3.5 mm headphone, FM radio and micro USB charging features. It supports dual SIM also. The handset comes packed with 1400 mAh battery. Lava Flair P1 is targeted at first time smartphone users and comes with decent specifications for reasonable price. The 3G support is one of the highlights of this budget smartphone. The smartphone is also stylish looking. 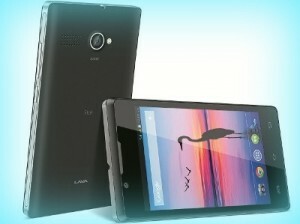 Lava is expected to launch three more handsets in this series in the coming months. It is expected to be made available on various e-commerce sites such as amazon, Flipkart and Snapdeal apart from offline retailers. This entry was posted in Launches, Tech on May 30, 2015 by Rakesh.